Hong Kong has long been the largest source of foreign investment in Fujian and the major gateway for Fujian enterprises to "go global" in financing and listing. 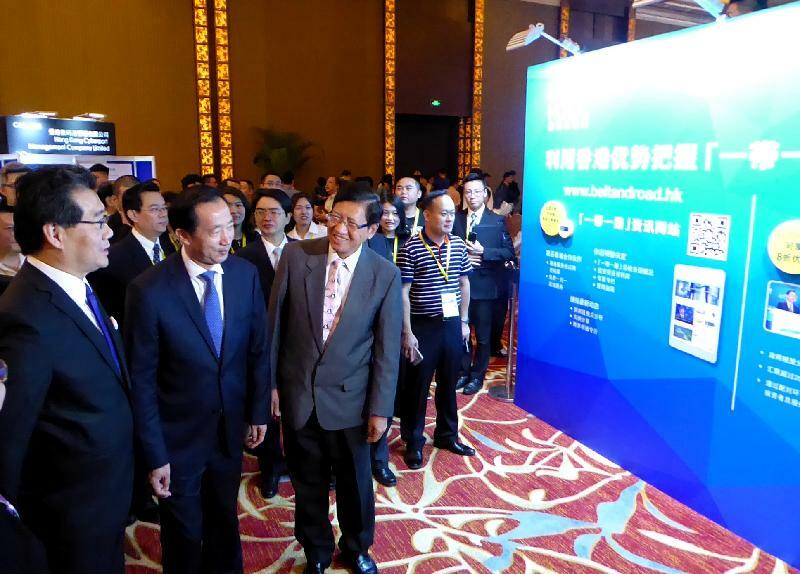 Under the Belt and Road Initiative, Hong Kong plays the role of a "super-connector" bridging the Mainland and global markets, said the Secretary for Commerce and Economic Development, Mr Gregory So, in Fuzhou today (May 25). Additionally, Hong Kong not only provides professional services to help mainland enterprises to "go global", but also brings capital, skills and talent to Mainland cities, added Mr So. 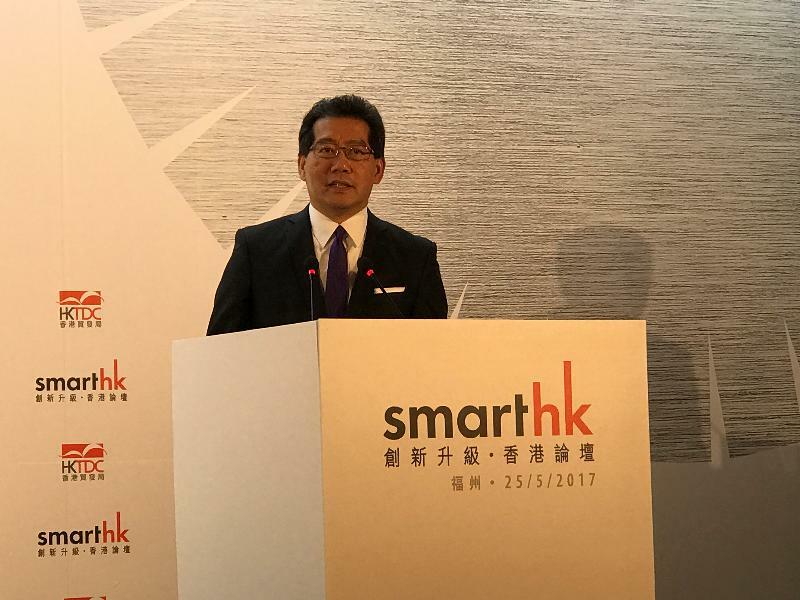 Speaking at the opening ceremony of SmartHK 2017 held by the Hong Kong Trade Development Council (HKTDC) in Fuzhou today, Mr So said, "Hong Kong and Fujian set up the Hong Kong-Fujian Co-operation Conference in 2015 to deepen the development and co-operation of the two places. Both sides obtain fruitful achievements from their exchanges and collaboration in such aspects as commerce and trade, finance, tourism, service industry, culture and education through this platform." Before the opening ceremony, Mr So and other officiating guests toured the SmartHK 2017 exhibition and exchanged views with the exhibitors. Mr So also held a breakfast meeting with the Vice-Governor of Fujian Province, Mr Li Dejin. 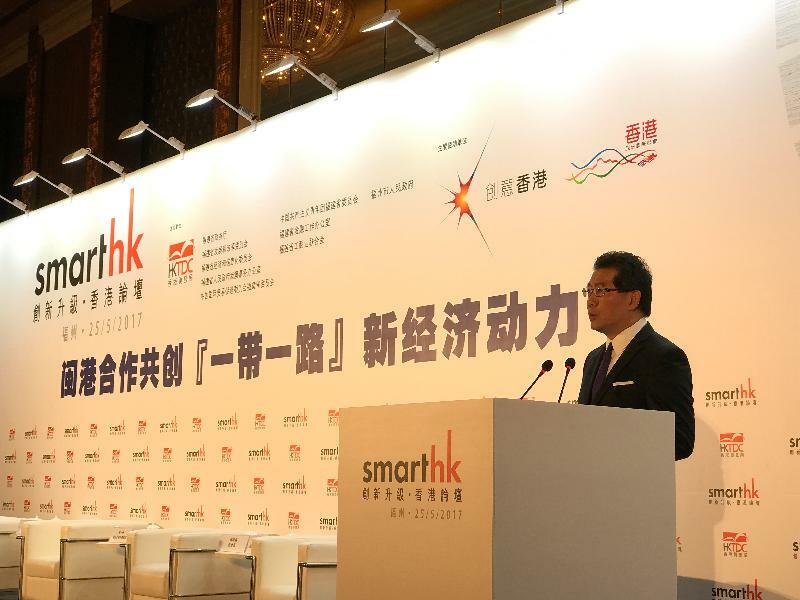 The HKTDC has been organising the annual SmartHK in major Mainland cities since 2011. With this year’s theme focusing on industrial transformation and upgrading, the event aims to showcase Hong Kong’s strengths in service industries and promote the city’s one-stop consultation services for Mainland enterprises. It is also the closing event of the Fujian Hong Kong Week 2017 organised by the Fujian Liaison Unit of the Hong Kong Special Administrative Region Government to celebrate the 20th anniversary of the return of Hong Kong to the Mainland. Mr So will return to Hong Kong this afternoon.